✔ BEST 60+ MILE RANGE ANTENNA: Strong Signal Reception! Support video Format: 720p, 1080i, 1080p | ATSC. Reception Range: 55+miles with amplifier. NOTE: Channel reception will vary depending on what's being broadcast in your area, how far away you are from broadcast towers, and your surroundings (i.e. obstructions between you and the towers). ✔ ONE-TIME PURCHASE, FREE FOR LIFE: The antenna picks up free broadcast High Definition TV signals like ABC, CBS, NBC, PBS, Fox, and more. From national TV networks to local TV shows, there's only the one-time purchase of the antenna, then there's no cost to you after that. ✔ AMPLIFIED ALUMINUM FOIL DIGITAL ANTENNA: This indoor antenna has adopted the newest filter technology in receiving signal and converting it into digital TV signal. Besides it shielded for minimum signal interference, reduces loss of signal strength and enables reception of a stable signal. ✔ DETACHABLE AMPLIFIED SIGNAL BOOSTER: In addition to being exceptionally thin with a mount-anywhere design (extra 3M stickers provided), this out-of-the way multi-directional antenna comes with a 13-foot coaxial cable that easily plugs into your HDTV (no power needed). Simply plug it in, mount, and scan for channels. It delivers full 1080p HD to any digital-ready TV. Signal booster and power adapter are also included in case you were located in a remote area with very weak signal reception. 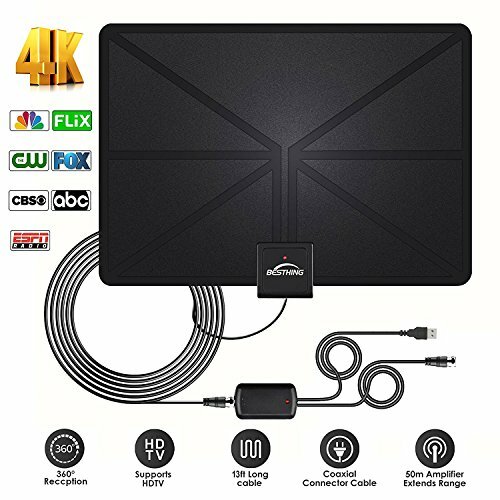 ✔ WHAT YOU GET: Indoor HDTV antenna with 13.12ft high performance coaxial cable, signal booster, power adapter, 3M stickers and stand. Enjoy your month-to-month TV viewing without an annoying contract or monthly fee.